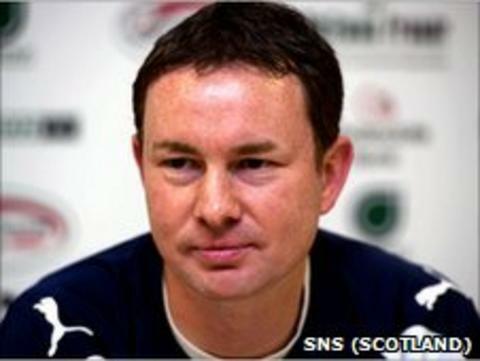 Derek Adams is to return to Ross County as manager, six months after leaving the club to become Colin Calderwood's assistant at Hibernian. Adams enjoyed success during his first spell at Dingwall, leading County to last season's Scottish Cup final, and is excited to return to the club. "The chance to be manager at Ross County again is just too good an opportunity to turn down," he said. "I have enjoyed my time in Edinburgh and I'm sorry to be leaving Hibernian." Chairman Roy McGregor is thrilled Adams has agreed to return to the club. McGregor said: "The past year has been difficult for the club, but we are now delighted to announce that Derek Adams has agreed to return as manager." Speaking to the club's website, McGregor went on to say: "I would like to personally thank Colin Calderwood and Rod Petrie at Hibernian Football Club for their professionalism and support in making this happen." Calderwood wished Adams well, but conceded it was a blow to lose him from his coaching staff. "I'm sorry to see Derek go, as we have a great relationship and he has been fantastic since joining us last year," he told the Hibernian website. "But the opportunities to be a manager are limited, and I completely understand his desire to be a number one again. I've really enjoyed working with Derek and wish him the very best in his new role."